The Nicola Nordic Ski Club organizes events at the Kane Valley ski trails near Merritt, BC. Our main social gathering is Chili Sunday, usually in January, from 11 AM to 2 PM. 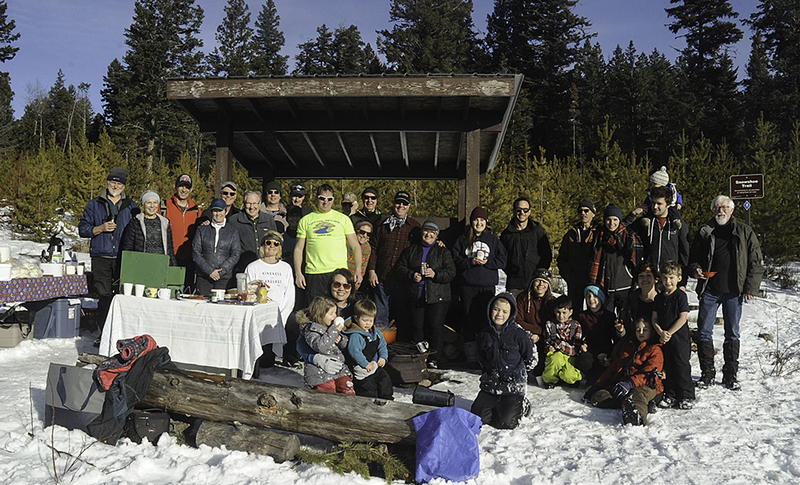 This is an occasion for members, families and friends to do some skiing and enjoy a fireside gathering at the the P3 or P2 shelters. This is a pot-luck event – everyone contributes some chili which is mixed together into communal pots (we also cater to vegetarians). The club supplies the buns, hot chocolate and other treats. Its a fun day and a chance to meet fellow-skiers. 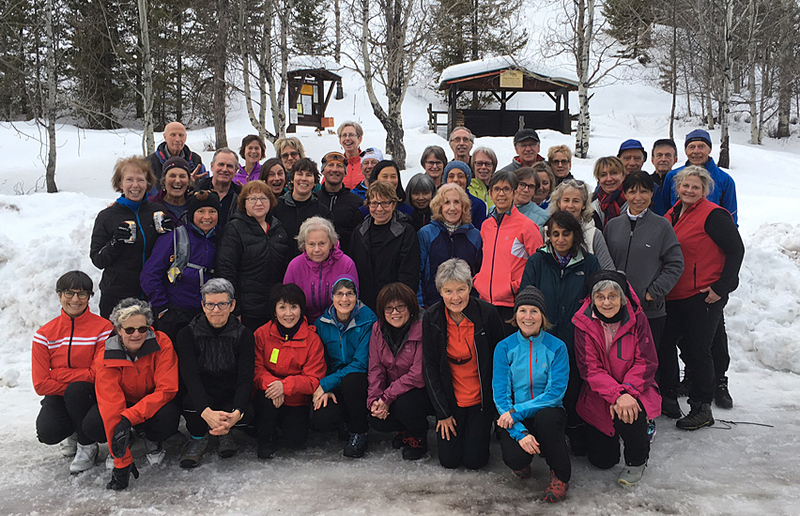 February 3, 2018: A busload of 50 skiers from the Vancouver area spent a day skiing and snowshoeing on the Kane Valley trails. They reported soft snow but good skiing and judging by the happy smiles in the photo they had a good time. We look forward to seeing them back again soon. December 2017: The Nicola Nordic Ski Club has a brand-new snowmobile and a new smaller (4ft) groomer/tenderizer. This was funded by the Thompson Nicola Regional District courtesy of local directors Herb Graham and Randy Murray. Thank you Randy, Herb and the TNRD! 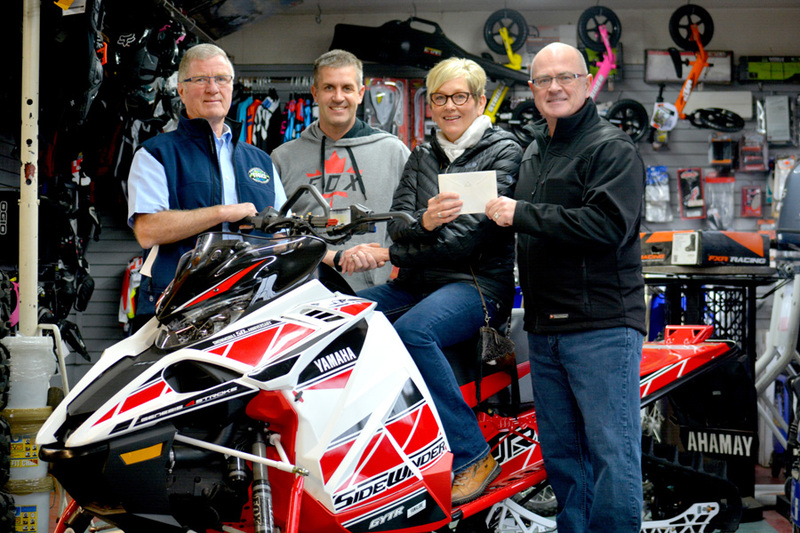 TNRD area “N” director Herb Graham, Nicola Motorsports owner Grant Klassen, Nicola Nordic Ski Club member Shelley Cressy-Hassel and area “M” director Randy Murray celebrated the purchase of a new snowmobile and groomer at Nicola Motorsports on Nov. 21. While the club will be receiving a new snowmobile, it won’t be the one pictured here, which belongs to Klassen. (Cole Wagner/Merritt Herald). With two grooming machines and two contractors we should be able to groom the trails more efficiently and the new machine will handle some of the steeper and narrower trails much better. December 2015: The Merritt Sunrise Rotary Club has awarded our ski club a $500 gift to help with the 2015-2016 cross-country ski season. The Nicola Nordic Ski Club is very grateful for this generous donation from the Sunrise Rotary Club. This club has previously funded the publication of our coloured trail maps. 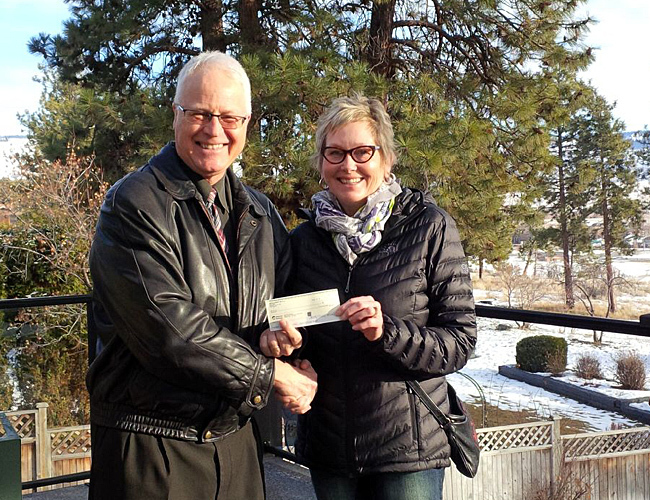 David Brown from the Merritt Sunrise Rotary Club in Merritt, BC presents Nicola Nordic Ski Club director Shelley Cressy-Hassel with a $500.00 cheque to help with the 2015-2016 ski season. Katharine Shewchuk was one of the founders of the club, has served many years as president and director and continues to be a strong supporter of the club and its events. Murphy Shewchuk has likewise been a founder, director and strong supporter of the club. For many years Murphy maintained the club’s website and he continues to provide the mapping of the Kane Valley trails, for our trail signs, website and brochure, and with detailed GPS locations at his own website. Katharine and Murphy Shewchuk with their Lifetime Membership certificate. 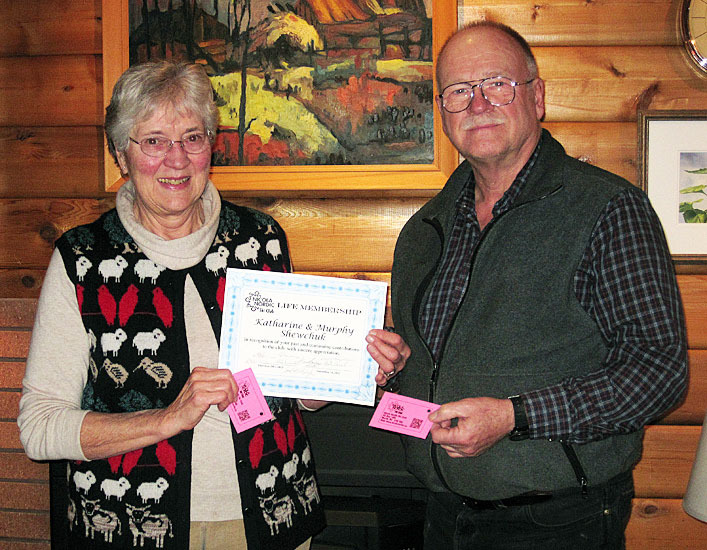 Gerry and Jill Sanford have contributed countless days to maintaining the Kane Valley Trails. Go out on almost any summer’s day and you will find them there – removing danger trees, cutting brush, burning piles of branches and keeping things in order. Gerry has also served as president and director and helped the club in many other ways. 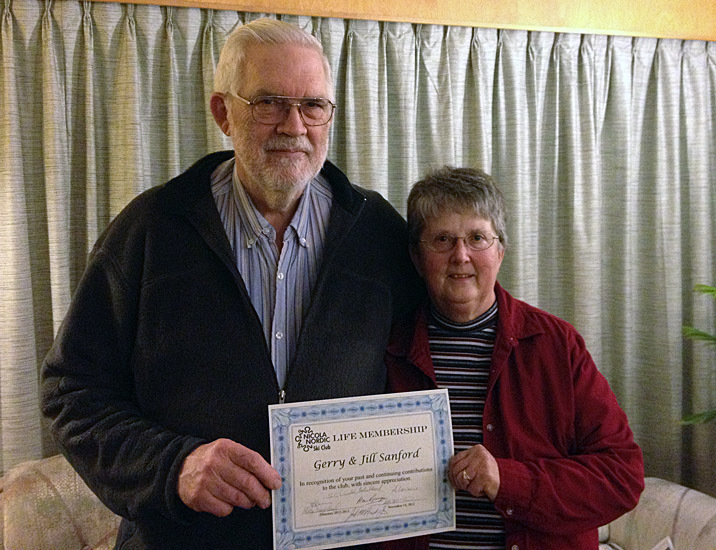 Gerry and Jill Sanford with their Lifetime Membership certificate. Congratulations! We look forward to many more years of your company and wisdom in the ski club.